I worked in the NHS in England for 20 years to 2006, that last 5 ½ as Chief Executive and Permanent Secretary of the Department of Health. 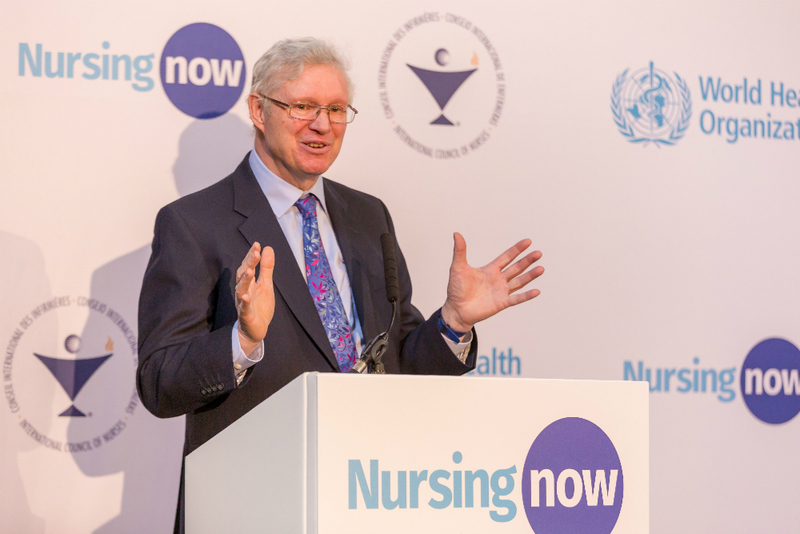 My focus throughout this period was largely on health services whether in running a teaching hospital or managing the whole system – and my account of my experience as Chief Executive 24 Hours to Save the NHS (2011) reflects the emphasis at the time on service improvements, waiting list reductions, and training more health workers. My subsequent experience in Africa and India over the last 10 years has led me to think differently about health and well-being and health systems and public services more generally. This is reflected in my writing about health creation and health-creating societies in the articles and reports below. The world has moved on and there is far more emphasis on disease prevention and health promotion than there was 10 years ago and recognition of the part played by the social determinants of health. Nevertheless, in my view these approaches do not go far enough and don’t recognise how all organisations must play their part in building a society and environment where communities and individuals can thrive and flourish. This goes far beyond the reach of the NHS and government – everyone has a role to play. 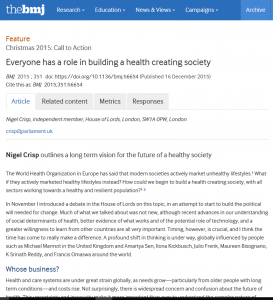 I have become involved in health in England again in the last 3 years and my work and writings on health creation and mental health reflect my attempts to change the dialogue and tell a different story about health, well-being, health creation and human flourishing. Many of these themes are also discussed in my writings on Global Health, Global Health in Parliament and Nursing Now! elsewhere in this website. Brexit and the troubled state of the NHS call for rethinking the UK’s approach to health. 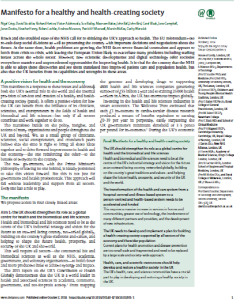 This Manifesto for a Healthy and Health-creating Society (2016) sets out a positive vision for health and the economy. The manifesto is written by some of the top UK clinicians as well as scientists and social entrepreneurs including the founder of the Big Issue and the leaders of Turning Point, Well North and the New NHS Alliance. It sets out 4 strategic areas for action: placing health research and science at the heart of the UK’s industrial strategy; accelerating the transition from a hospital and illness based system to a person and health based one; enabling all sectors to play their part in health creation; and using the underlying values of the NHS and science to help heal rifts in our society. 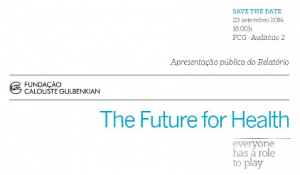 The Future for Health – everyone has a role to play (2014) is the report of the Gulbenkian Commission on the Future of Health in Portugal which I chaired. It involved people from all sectors of Portuguese society and has been very well received – with most of its recommendations now government policy. The report calls for a new Compact for Health in Portugal which recognises the role that all sectors must play. It places the focus on action by citizens and society and a transition from today’s hospital-centred and illness based system where things are done to or for a patient to a person-centred and health based one where citizens are partners in health promotion and health care. It also argues for some reduction in duplication of services, better access for patients and a greater role for nurses. Everyone has a role to play in building a health-creating society (2015) outlines a long-term vision for the future of a healthy society. It draws together examples and experience from the UK and beyond to illustrate how in the words of the World Health Organization modern societies actively market unhealthy lifestyles. The article goes on to describe how different sectors can play their part – from schools to employers – and argues that we need to build up political support for these ideas. It will be difficult because the whole health care industry – both public and private – is organised to maintain the status quo. Significant change will only come at scale when these ideas are internalised by our clinical leaders and understood and supported by leaders in other sectors and by wider public opinion more generally. 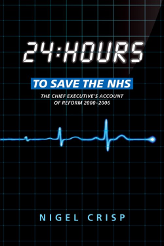 24 Hours to Save the NHS (2011) describes the development of the NHS Plan in 2000, its subsequent implementation and the changes it went through over the next few years which led to greater involvement of the private sector, greater devolution and accountability, and major service improvements. I was charged with delivering the Plan and this account describes the way I and colleagues approached the task. The book title was a Labour Party slogan before the 1997 election which claimed that only they could save the NHS. I argue that in the 10 years from 2000 a great deal was achieved with most improvement targets hit, public satisfaction almost doubling, patient leaving the private sector to use the NHS and, very importantly, all parties vying with each other to be the best guardians of the NHS. I conclude that the NHS was saved but not made sustainable, that is the current battle to be won. More information about 24 Hours to Save the NHS. 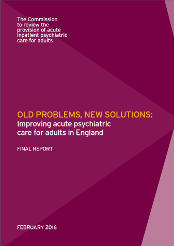 Both reports deal with the problems of admitting acutely ill adult patients to mental hospitals – assessing the situation and its causes and making recommendations. In both countries we discovered that the admission problem was significantly due to a high percentage of patients (on average about 1 in 6) being ready for discharge but having nowhere else to go while a similar number had been admitted because there weren’t suitable places for them in the community. The recommendations were largely accepted by the government in England and implementation is being monitored.